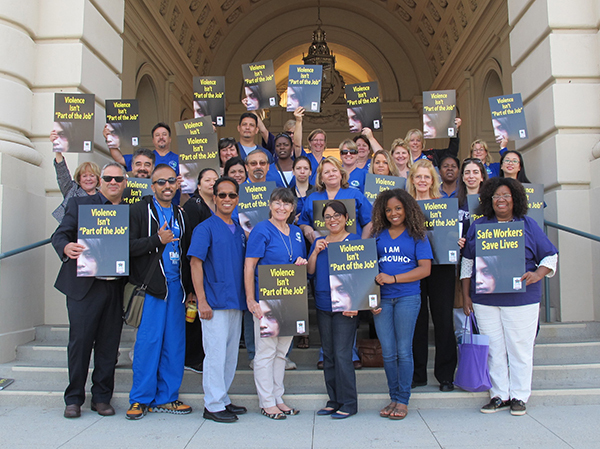 San Dimas, CA—Following years of advocacy work, registered nurses and health care professionals from the United Nurses Associations of California/Union of Health Care Professionals (UNAC/UHCP) will finally see their efforts come to fruition with the implementation of new workplace violence prevention regulations in California. Beginning April 1, 2017 employers must comply with recordkeeping and reporting requirements in the Workplace Violence Prevention in Healthcare standard approved by the California Occupational Safety and Health Administration (Cal/OSHA). Additional requirements, including the establishment of a workplace violence prevention plan, training of employees, and review of the prevention plan will be implemented by April 1, 2018. The importance of establishing such regulations was made clear – and personal – by members of UNAC/UHCP, who shared personal stories with the media of being attacked in the workplace, signed a petition to Cal/OSHA calling for protections, rallied and testified at Cal/OSHA hearings throughout California as regulations were being drafted. Among those testifying was UNAC/UHCP Secretary Elizabeth Hawkins, RN. California is the first state to enact health care safety regulations that apply to both public and private health care workers.